One skill I possess with secret satisfaction is the ability to drive a standard shift. Since my general automotive knowledge is so painfully limited, there is some consolation in mastering this much of the transmission. My favorite car of all time was a five-speed, fire-engine red Toyota Celica. Behind the wheel I was queen of the open road! It was a bittersweet day when I finally had to trade it in for a more conservative mom-mobile. Sigh. Eventually I did go on to drive another five-speed. While shuttling kids to karate and dance lessons didn’t exactly give me the chance to ‘tach it up,” it was reminiscent of those earlier, carefree days. 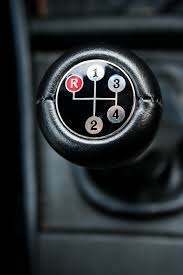 I love driving a stick shift. That is, when it works. After 93,000 miles of city driving, one of the interior parts of my gear shift began to wear out, making it harder and harder to handle. Then it started making suspicious noises. I knew I had a problem—I just didn’t know how big it was. Imagine my relief when several good Samaritans came running to push my car into a nearby fast-food parking lot. Meanwhile, an emergency call was made to dear husband, who contacted a tow truck for me. Within the hour, my disabled vehicle was in the care of the car dealership, where we learned it only needed minor repairs. There have been many times since when I have felt “stuck in neutral.” I’m stranded helplessly while others honk and keep going. Try as I might, I can’t make life respond the way I want. I’d be thrilled to get in gear and get going—but hitting the pedal does nothing but create a lot of useless noise. So there I sit, chafing at the delay and loss of momentum. After all, we’re supposed to keep moving forward, aren’t we? However, as I learned during our car dilemma, even in the midst of setbacks we can still be thankful. In that instance, we were grateful for many things: strangers who rushed to our aid to move us to safety. The lightning-swift response of the tow truck. My husband, who left work to come help shuttle our extra passengers. Friends who detoured on their way home to offer additional assistance. The cooperative attitudes of five high-spirited children who, armed with sodas and French fries, helped me to see the whole experience as an adventure, rather than a disaster. We were stranded, but not abandoned. While we felt stuck and powerless, God was working in mighty ways to move us forward. As it turns out, “stuck” is not such a bad place to be. When I’m constantly moving ahead in pursuit of the next thing, I risk rushing past some of the best things. Sometimes being forced to idle is just what I need to shift my attitude from impatience and worry . . . to trust and gratitude. After all, I’m riding with the One fully able to get life in gear.